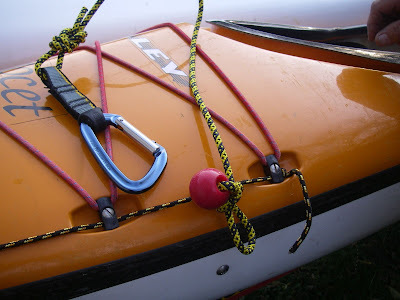 On Friday afternoon, while we were paddling, someone broke into our car and stole both of our wallets. We returned to a broken car window and a rash of urgent tasks: cancel the cell phone and credit cards, rekey the house locks, replace the drivers' licenses and a myriad other cards. Since then, every day yields a new realization of something we no longer have: library cards, ACA instructor cards, insurance cards, a favorite green pen. 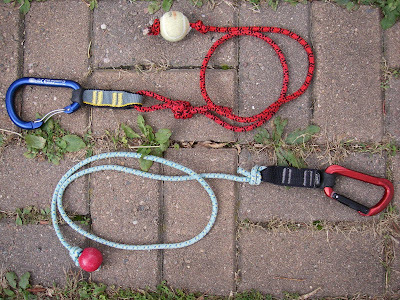 Today we realized the thieves also had the cool set of knot cards we bought with our paddling.net paddle perks and the rope we used for practicing clove hitches and bowlines. 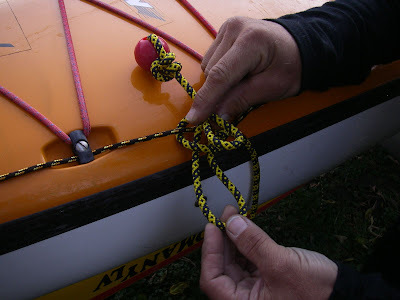 Somewhere, some thief is practicing tying beautiful bowlines. Note to selves: Bring wallets in boats. 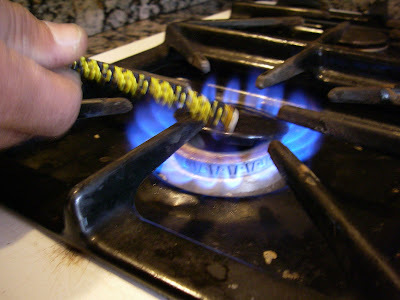 Keep house key away from IDs with home address. 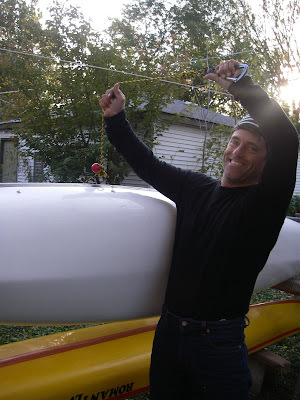 Renew paddling.net membership. For those of you who read yesterday's post and thought, "That's cool, but I wish I could read about it in French," we have good news! It was picked up today by "Le Kayak et la mer." En principe tous les kayakistes ont déjà un bout de remorquage long, c’est obligatoire en 6eme catégorie. 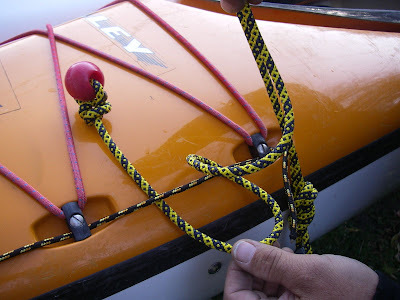 Mais plus rares sont ceux qui possèdent un bout court pourtant bien utile pour sortir rapidement un kayak d’un endroit difficile, assurer une pagaie ou même servir de leach. 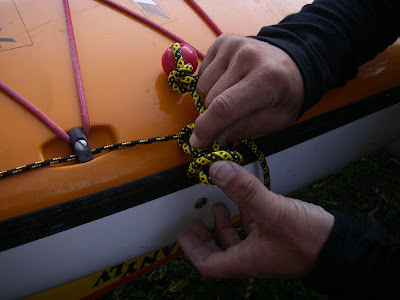 Vous trouverez sur le site Have kayaks, will travel une méthode très détaillée pour en fabriquer un de très bonne qualité ainsi qu’une méthode d’utilisation. C’est en anglais mais les nombreuses photos sont très explicites. Je crois bien que je vais m’en construire un sur ce modèle. 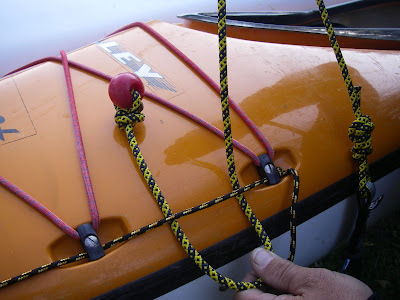 When I was preparing to go out to Sea Kayak Georgia a few years ago to do some training before my Instructor Development Workshop, I needed a short tow setup. So I went out and bought a good-looking one for about $40. During the second day of training, Ronnie Kemp and I were working on rescues. 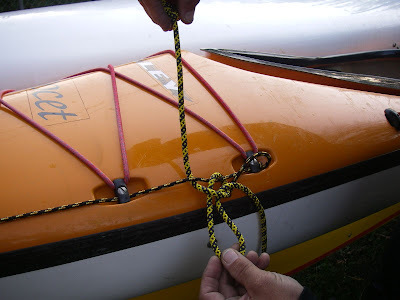 I was required to quickly release my tow belt and attached short tow in surf. The brand new short tow slid off the belt and sank. Ronnie later showed me a type of short tow that can be made for a fraction of the cost of a commercial system. The parts are available at many outdoor sporting goods stores (or online--I've placed links below). 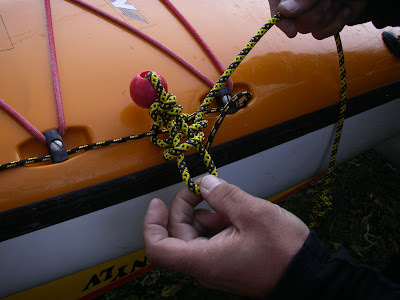 The set-up connects to the deck lines in front of the paddler, where it's easy to reach, and uses an ingenious quick-release highwayman’s hitch, which allows it to be disconnected from the boat easily and quickly (essential for any tow system). 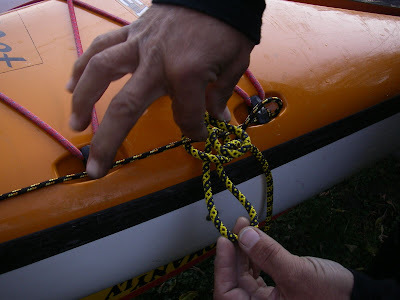 This is one of the first pieces of gear Sharon and I have made for ourselves; we find that the more we create and repair our own gear, the better we understand it and can make it suit our needs and the conditions we paddle in. So here is the short tow system we use and how we put it together. Make sure you have the training to use it appropriately, and let us know what you think or what modifications you make. 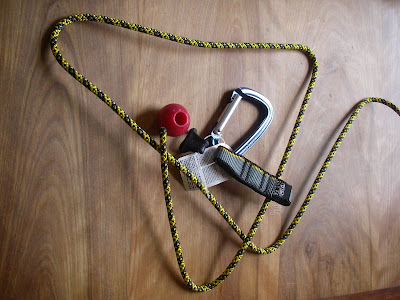 All the materials you'll need to create a short tow set-up. 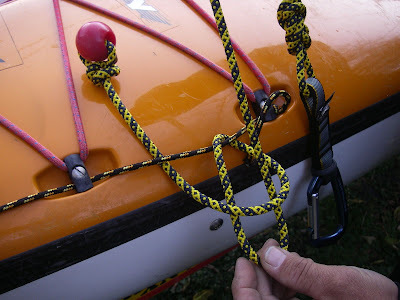 Figure-of-eight follow-through connecting the rope to the runner. 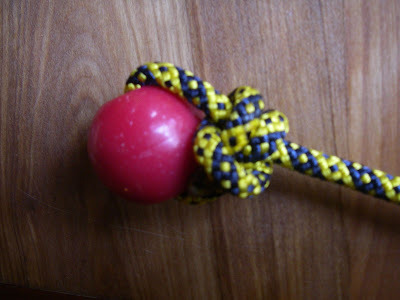 For instructions on this knot, click here . 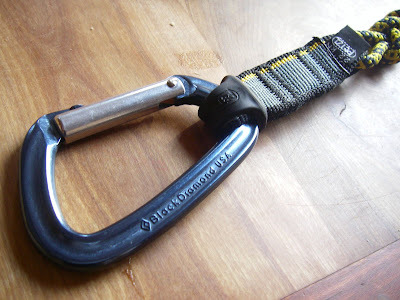 Now connect the runner to the carabiner. 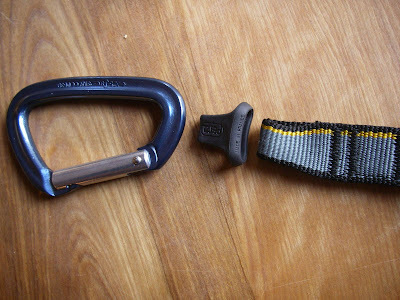 The runner prevents the rope from slipping off the carabiner. Your short tow is complete! 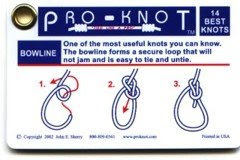 Now it's time to attach it to your deck lines. 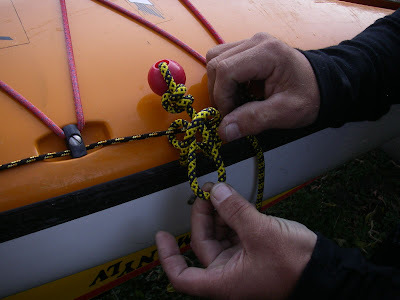 Here is one way to use a highwayman's hitch to connect it. 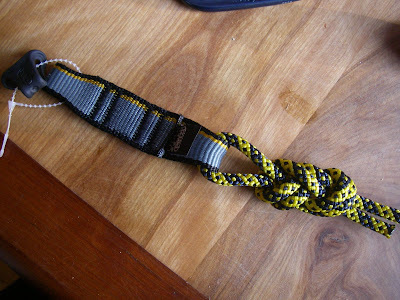 This is, essentially a series of slip knots, but they need to be done correctly in order to work properly. Saturday was the annual Geneva Kayak Center Kayak Fest, a day of free classes and an evening of socializing--sort of like a mini symposium but with boats and gear on sale and without the sleepover or registration fee. We taught many classes at Geneva this year, so we were psyched to see some of our students again. We were also eager to see some of our fellow instructors, though we anticipate seeing them in the surf on Lake Michigan in the coming weeks (fall is surf season in Chicago) and then in the pool on Wednesday evenings during the winter. It was a beautiful fall day. Some of the trees along the banks of the Fox River were rich hues of orange and gold; geese and herons adorned the water and banks. But best of all, the river was full of kayakers, many of them beginners or near-beginners, eager to learn new skills before the end of the paddling season. Students who attended Kayak Fest were rewarded with free classes and lovely weather. For us, the season isn't quite over. 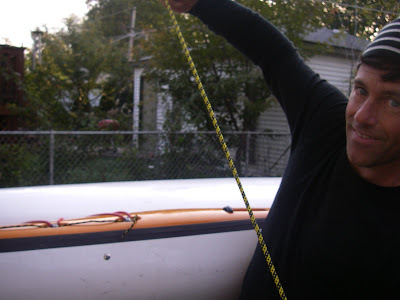 Dry suits and sufficient skill enable us to safely paddle into November and December. In the coming weeks, we'll chronicle some of the beauty of Lake Michigan settling into the solitude of its colder season. But for now, we're enjoying looking at the photos from Saturday. Funny, but people are smiling in all of them! Paul Doughty in a rare moment on the other side of the camera. In fact, taking a break helped us clarify why we blog. 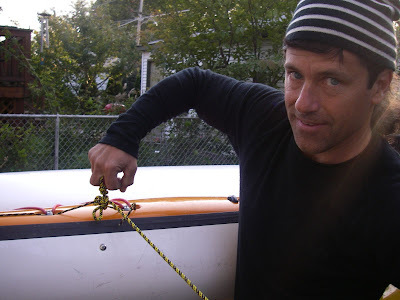 Over the summer, we used the blog to share our thoughts about kayaking, teaching people to kayak, and the paddling community. We used it to publicly ponder ideas, poke fun at ourselves and sometimes others, call attention to people and places and sometimes problems, and celebrate what we've learned and what we've done. We were surprised and pleased by the response we got. In one month, more than 1,000 people visited our blog, even though we did little to promote it. We received thoughtful comments online and in person from people near and far, including some of the students in our classes. Clearly, something we were doing was entertaining, useful or both. We continued padding after our last post, though not as intensely as during those two months, when padding was nearly a daily activity. Even now, with the air and water temperatures dropping, the days growing shorter and the shadows growing longer, we're out there in our dry suits, enjoying the relative solitude of Lake Michigan in the fall. 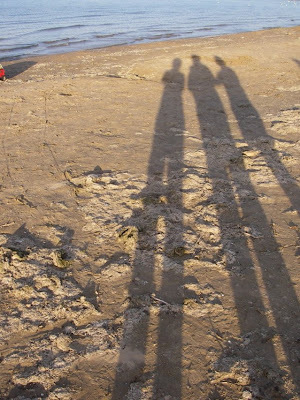 The days get shorter, the shadows get longer, and we get taller! Starting now, we will do our best to post weekly. 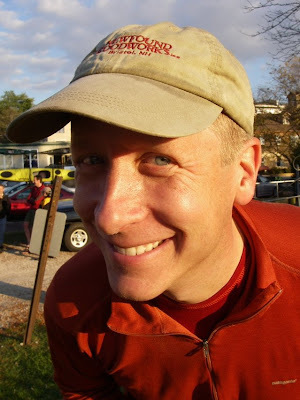 This blog will stay kayaking-focused; we won't subject you to random musings about life, the universe, brownies and all that. Rather, we'll continue the journey we began back in June, when we asked you to come with us on our quest to become better paddlers, better instructors and better bloggers. So welcome back. We hope you visit weekly, comment occasionally, and benefit from what you find here. An impromptu slalom course near a Chicago beach.